Sterling Silver Butterfly Toe Ring - This toe ring is not this shiny - it actually has a sterling silver antiqued finish to make the filigree work more visible. 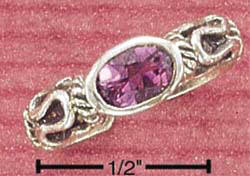 It is adjustable, the band is 2mm wide and the butterfly is approx. 9mm. 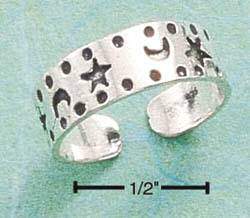 Sterling Silver Double Dolphins Toe Ring - Fun for the beach and summer! 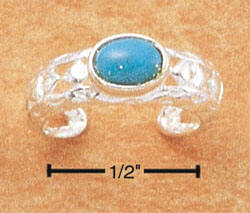 Sterling silver adjustable toe ring with 3-D dolphins. 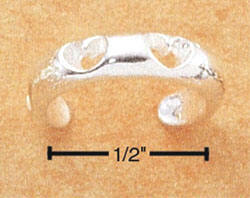 The band is 3mm wide. 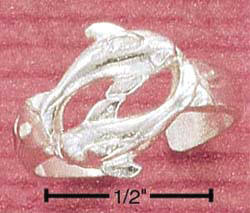 The dolphins are 10mm wide at the widest point. 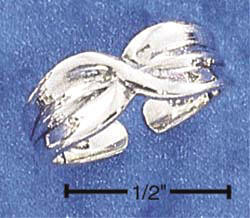 The dorsal fins are 4mm high! Sterling Silver Cut-Out Hearts Toe Ring - This adjustable sterling silver toe ring is 4mm wide and features a heart cut-out design all around the band. 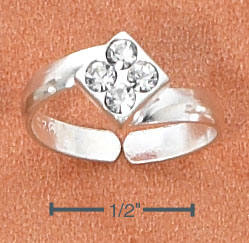 Sterling Silver Crossed Wrap Toe Ring - This sterling silver toe ring looks like the two sides cross over each other. 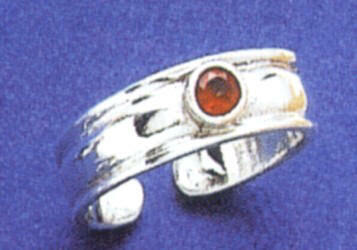 It is 1/4" wide and tapers to 3mm at the adjustable bottom. 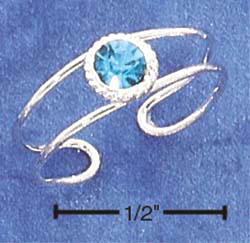 Sterling Silver Clear CZ Toe Ring and Sterling Silver Blue CZ Toe Ring - This is a sterling silver open shank toe ring. 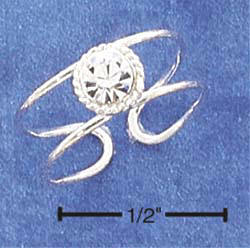 In the center is a 4mm faceted round clear cubic zirconia stone surrounded by a delicate rope design. 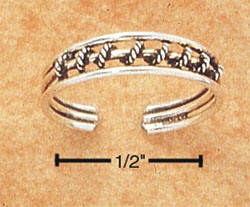 Sterling Silver Lines and Bands Toe Ring - This sterling silver adjustable toe ring is 4mm wide. It has an antiqued horizontal line pattern with overlaying vertical bands. Sterling Silver Celestial Toe Ring - This adjustable sterling silver toe ring has a dotted edge and features stars, suns and moons. 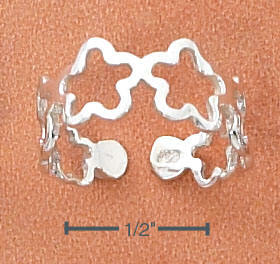 Sterling Silver Triple Daisy Toe Ring - This sterling silver adjustable toering features three daisies. Sterling Silver Greek Key Toe Ring - This sterling silver adjustable toe ring features a continuous antiqued Greek key design. 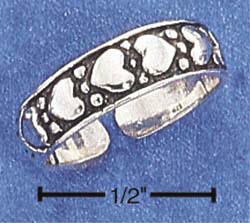 Sterling Silver Wave Toe Ring - This sterling silver adjustable toe ring features a textured and antiqued wave design. Sterling Silver Heart and Arrow Toe Ring - This adjustable sterling silver toe ring features a heart and arrow design. Sterling Silver Wire Toe Ring - This adjustable sterling silver toe ring has a wire-wrapped design. 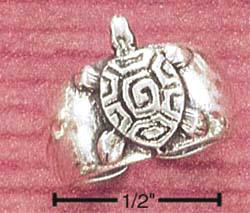 Sterling Silver Turtle Toe Ring - This sterling silver adjustable toe ring is wide with a turtle in the center. Sterling Silver Blue Crystal Star Toe Ring - This adjustable sterling silver toe ring has an open band design with a light blue crystal star in the center. Sterling Silver Hearts Toe Ring - This adjustable sterling silver toe ring has open alternating hearts going around the band. 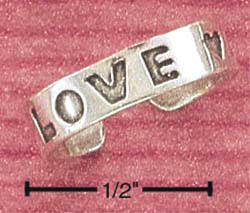 Sterling Silver LOVE Toe Ring - This sterling silver adjustable toe ring is 4mm wide. The word "Love" and hearts alternate around the band. 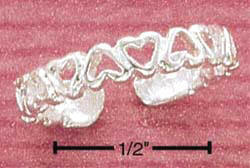 Sterling Silver Wavy Hearts Toe Ring - This sterling silver adjustable toering is approx. 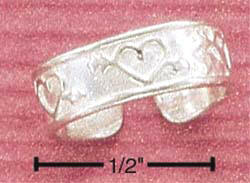 7mm wide with a wavy heart design. Sterling Silver Cut-Outs Toe Ring - This adjustable sterling silver toe ring features a continuous cut-out design (could be a flower, could be a star). 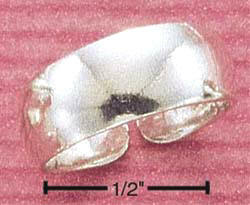 This toe ring is 6mm wide. 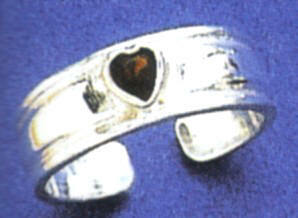 Sterling Silver Hearts and Beads Toe Ring - This sterling silver adjustable toe ring is 5mm wide. It has a hearts and beads pattern across the top. Sterling Silver Crystal Toe Ring - This adjustable sterling silver toering features a 5mm diamond-shape center with 4 clear crystals. The adjustable band is 2mm wide. 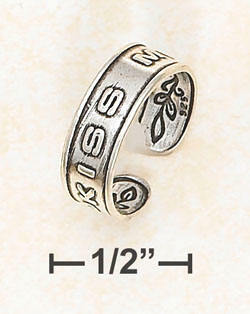 Sterling Silver Flat Floral Toe Ring - This sterling silver adjustable toering is approx. 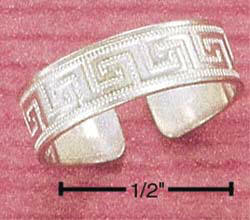 4mm wide with an antiqued "flattened" floral pattern. 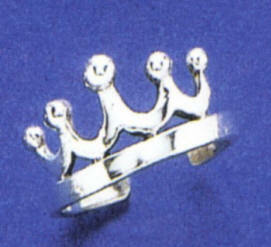 Sterling Silver Crown Toe Ring - This adjustable sterling silver toering is approx. 10mm at the widest point of the crown design. 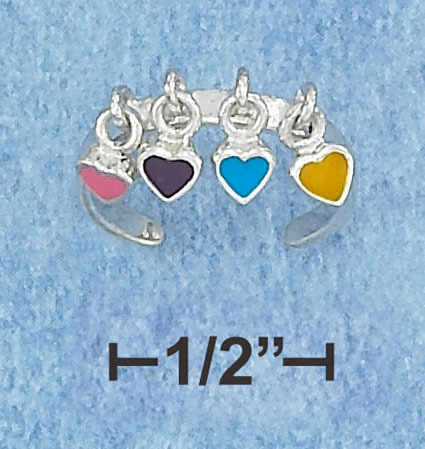 Sterling Silver Multi-Color Dangling Hearts Toe Ring - This sterling silver adjustable toering band is approx. 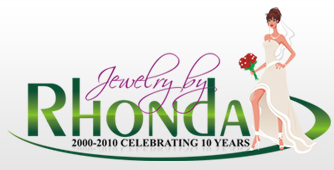 3mm wide with four multi-color enameled dangling hearts. Sterling Silver Buckle Toe Ring - This sterling silver adjustable toe ring features a very realistic looking buckle design. It is 8mm wide at it's widest part on the buckle and graduates to 5mm wide. Sterling Silver Wide Toe Ring - This sterling silver adjustable toe ring is 5mm wide, but graduates down in size for comfort. Sterling Silver Purple Flower Toe Ring - love this toe ring. 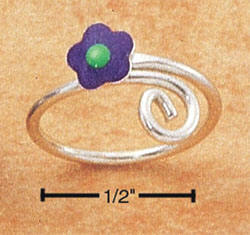 It is sterling silver and adjustable with an enamel purple flower with a green center - the colors are so cool! Sterling Silver Turquoise Toe Ring - Sterling silver adjustable toe ring with connecting hearts on the band and an oval turquoise cabochon in the center. 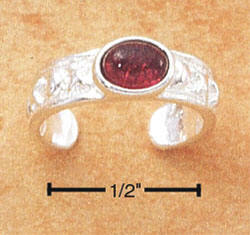 Sterling Silver Garnet Toe Ring - This sterling silver adjustable toering has a hugs-and-kisses design around the band and a genuine garnet cabochon in the center of the band. 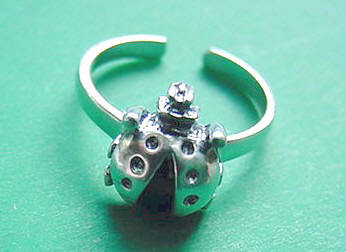 Sterling Silver CZ Butterfly Toe Ring - Want a toe ring that gets noticed? 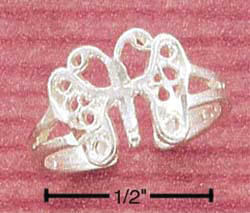 This adjustable sterling silver toe ring has a beautiful clear cubic zirconia butterfly on the top. 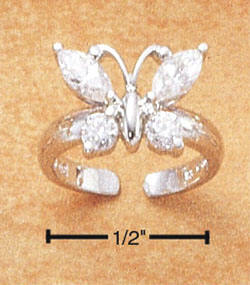 The butterfly is 10mm x 12mm with prong-set marquis and round genuine cubic zirconias. 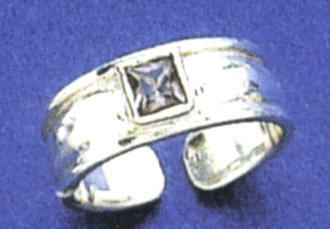 This toe ring is rhodium-plated (added for it's anti-tarnish benefit) sterling silver. 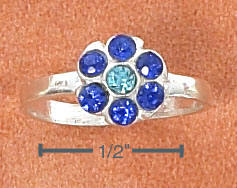 Sterling Silver Blue Crystal Flower Toe Ring - This sterling silver adjustable toering features a flower design with two different shades of blue crystals. 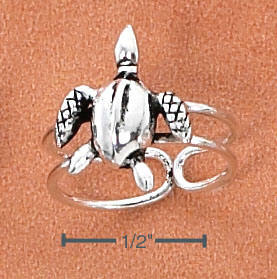 Sterling Silver Turtle Toe Ring - This sterling silver adjustable toering has a split shank design with a sea turtle in the center. 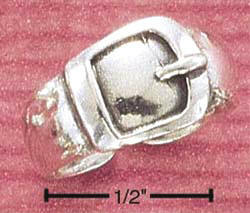 Sterling Silver Dude Toe Ring - This adjustable sterling silver toering has a "dude" on it and is approx. 7mm wide. 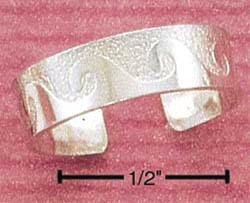 Sterling Silver KISS ME Toe Ring - This adjustable sterling silver toering is 5mm wide with "kiss me" and a scroll-work pattern all the way across.